In this session Sr. Dianne continues the discussion on scripture passages related to Laudato Si by Pope Francis. She reviews anthropocentrism and integral ecology. Being human centered is natural. The challenge is when we value something, do we evaluate it only from our standard of how it pleases us? As human beings we are limited. There are some things that we can’t understand. But sometimes we refuse to acknowledge our limitations. Sr. Dianne then talks about the idea of the Sabbath day – and Sabbath year – as found in Leviticus 25: 1 -7, Exodus 20: 8 -11 and Deuteronomy 5:12 – 14. Sister Dianne notes that Leviticus prescribes a Sabbath year for the land. It is rest for the land, and for the workers, the owner, and the animals. We know that it is sometimes good to let land lie fallow and it becomes more productive after that. Sr. Dianne draws the conclusion that the world is not totally dependent on us and we are not the most important, but there is an interdependence. We do have a responsibility for the earth. The question is-- are we faithful to that? 5.) Our website (www.wordnettv.net) 24/7. 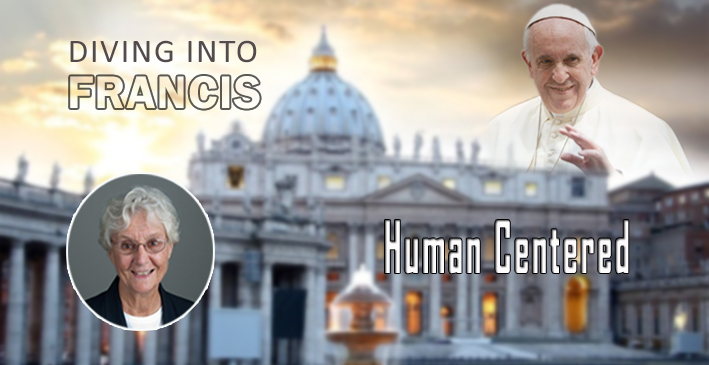 Watch HUMAN CENTERED now by CLICKING HERE! Amazon supports us; won't YOU? Over $800 so far! Amazon-Smile has contributed $124,651,081.04 to Charities. Wordnet with your help has received $834.51 to date. Shop for GOODNESS sake!! And Thank you!